First on the list was Evangelical Christianity (US. Christians). Fifth on the list was Al Qaeda. Later on the list was Catholicism (US Christians). 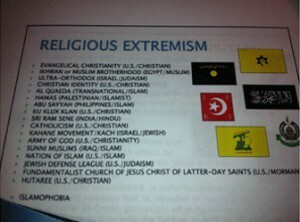 At the end of the list was Islamaphobia. There are millions of evangelical Christians in this country, as well as Catholics. To label them as haters and as dangerous boggles the mind. Many of them pray daily, “Thy will be done on earth as it is in heaven.” Or “…where there is hatred, let me sow love…” Where’s the hate? Some have said that the Army person putting this slide together traced her information back to the Southern Poverty Law Center (SPLC), based in Montgomery, Alabama. One of the groups who sued former (and current) Alabama Chief Justice Roy Moore for having the Ten Commandments on display at the state judiciary building in Montgomery was the SPLC. Prominent on their own building are words also carved in stone, attributed to Dr. Martin Luther King, Jr. “Let justice roll down…” These are words of Amos, also in the Old Testament. Dr. King’s church, Dexter Avenue Baptist, is just down the street from the judiciary building. It was in that church that the civil rights movement was born—when a group met there in the mid-1950s to deal with the injustice that had just been meted out to Rosa Parks. The word “hate” is bandied about these days to the point that it seems to be losing its meaning. People who love are often called haters because they don’t happen to hold to the latest politically correct view on the definition of marriage or on abortion. SPLC says on their website: “The Southern Poverty Law Center is a nonprofit civil rights organization dedicated to fighting hate and bigotry, and to seeking justice for the most vulnerable members of society.” Sounds great, until you look at some of their stances. For example, they have a map of hate on their website. Click on any of the states, and you’ll see listed organizations branded as hate groups. I work at one of them, Truth in Action Ministries. We’re right there with “United Klans of America,” an offshoot of the KKK. SLPC brands us as “Anti-Gay.” We certainly believe what the Bible says—that all sinners (and that’s all of us) can be forgiven when we repent of our sins and come to Christ and ask for forgiveness. Thousands of ex-homosexuals are alive today who have found hope and change through the Gospel of Christ. Yes, we promote that at Truth in Action Ministries; and, of course, we believe that marriage is the union of one man and one woman. But we don’t hate anyone. Family Research Council in Washington, DC is also on SPLC’s map of hate. That fact almost led to serious bloodshed. Dr. King told his followers, “We must meet hate with creative love.” He added, “Let us hope there will be no more violence. But if the streets must flow with blood let it flow with our blood in the spirit of Jesus Christ on the cross” (Birmingham, May 1963). If that were the case, would SPLC label Dr. King a hater? If so, maybe they should take a hammer and chisel to his scripture quote. As it stands, the SPLC is, by their actions, denying the meaning of Dr. King’s (and Amos’) words. Previous Is Heaven Just a False Hope?